Kids Who Watch a lot of TV Eat 500 Extra Snacks a Year! The study examined whether teen boys and girls report similar negative impact of sleep disturbances on their daytime functioning. "What was most surprising is the fact that teenage girls reported a higher degree of interference of daytime sleepiness than teenage boys on multiple aspects of their school and personal activities," said co-author Pascale Gaudreault, who is completing her doctoral degree in clinical neuropsychology under the supervision of principal investigator Dr. Geneviève Forest at the Université du Québec en Outaouais in Gatineau, Québec, Canada. "For example, teenage girls have reported missing school significantly more often than teenage boys due to tiredness, as well as reported having lower motivation in school due to a poor sleep quality." 731 adolescents (311 boys; 420 girls; ages 13 to 17.5 years; grades 9-11) completed a questionnaire about sleep and daytime functioning. Questions were answered on a seven-point Likert scale (1=never; 7=often). Gender differences were assessed using t-tests. Study results show that teenage girls reported more difficulties staying awake during class in the morning, during class in the afternoon, and during homework hours than boys. They also reported feeling too tired to do activities with their friends, missing school because of being too tired, feeling less motivated in school because of their poor sleep, and taking naps during weekends more often than boys. However, there was no gender difference when it came to using coffee or energy drinks to compensate for daytime sleepiness or for falling asleep in class. "These results suggest that teenage girls may be more vulnerable than teenage boys when it comes to the negative impacts of adolescence's sleep changes," said Gaudreault. The research abstract was published recently in an online supplement of the journal Sleep and will be presented Tuesday, June 5, in Baltimore at SLEEP 2018, the 32nd annual meeting of the Associated Professional Sleep Societies LLC (APSS), which is a joint venture of the American Academy of Sleep Medicine and the Sleep Research Society. American Academy of Sleep Medicine. 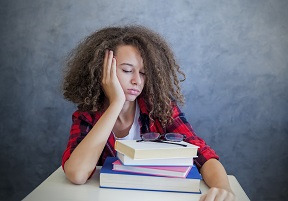 "Teenage girls are more impacted by sleepiness than teen boys are: Sleep disturbances in girls associated with more difficulties staying awake in and out of school." ScienceDaily. (accessed July 27, 2018).